When I was 24 and had just started my first “corporate” job the women used to ask me why I never wore makeup. I used to laugh it off and say “I have to be making at least $40 000 before I’ll wear makeup to work!” While I’ve way surpassed that salary, I don’t bother wearing makeup because it’s just another task to add to a list of things that takes me forever to do. I am all about streamlining most processes and while not wearing makeup is a great way to save time in the morning, optimizing your work wardrobe is even more important. 1 – Take stock of what you own: Most of my wardrobe consisted of things a new mom and a person who cleaned houses would wear – because that was my life! I did have a few serviceable pieces from the past that still looked good but not much. 2 – Figure out what you need: I didn’t just say to myself “I’ll spend $300 on a new wardrobe” and then went shopping. I tried to figure out what I could manage bare minimum without looking like I wore the same thing every day. 3 – Consider ease of use: While most people may think this is weird, I tried to figure out what would take me the least amount of time to assemble in the morning. Thinking about it, I hated that in the past I would try on clothes, reject them, try on something else…ad infinitum. When you have to figure out a few components of a wardrobe, I felt it was too time consuming. The idea of fishing out socks, deciding on pants or a skirt, and then finding a shirt…seemed like more steps than I needed. It was easier to just buy dresses and tights: two steps in the winter, one in the summer. Now, I have never been much of a dress person, it’s not really my style. If you were to see me when I am not working, you’d note that my fashion sense tends to be of the jeans-and-t-shirt variety. But it occurred to me that if I stuck to basic colours I could get away with 10 dresses and 5 pairs of tights in the winter, and in the summer it would just be dresses and sandals/shoes. It doesn’t get much easier than that. So with that in mind, I created my base. Check out thrift stores: I got some great pieces by checking out the local thrift stores. People have a tendency to gain weight rather than lose it, so the thinner you are, the better chances you have at finding great pieces that still look good after many washings. Shop discount retail: When I first started working we used to go to the US every summer and rent a cottage for a week. I would take advantage of the great selection at Target (before their ill-fated foray into the Canadian market) to get some great pieces at rock bottom prices. They always had my size and their clothes still look great five years later. Shop sales at mid-range retail: one of my favourite places to shop is a Canadian outfit called Ricki’s (I get no kickbacks, alas) because their clothes fit right, they are extremely high quality, fashionable, and last forever. They also have great end-of-season sales. I know I can take advantage of the web sales and the clothes will fit great. Old Navy sometimes has some great pieces and their sales are decent but I find their clothes are often ill-fitting. Find stores whose clothes fit right for your body type and then take advantage of their sales. Fabrics: fussy fabrics aren’t worth your time. I have often come across pieces of linen, silk, cashmere, and cotton that I love but there is no way. Those fabrics are not easy to care for and I only want things that I can throw in the washer and dryer that come out looking great. I loathe ironing so anything that requires a pressing is off my list as well. 5 – Accessorize: I’ll be honest, I am not one for earrings, necklaces, bracelets, and scarves. I tend toward being super plain and that is a style choice as much as it is easy for me to not have to deal with. Still, I do need tights, sweaters, shoes, and blazers so I am sticking these under accessories as they can be repurposed for various outfits. Stick to to basics: My core accessories three cardigan sweaters in brown, grey, and black. 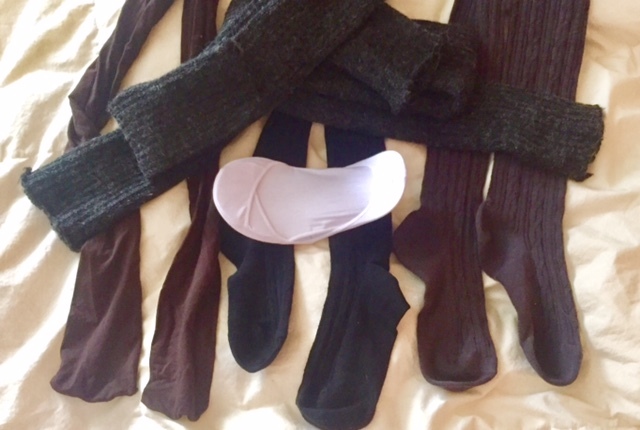 I have tights in brown, grey, and black, and I have shoes in … you guessed it: brown and black*. I really try and spend the extra money on wool or thick cotton tights if I can find them because they last for years, and I never buy nylons because they don’t last. In summer when I need to wear shoes and not sandals, I just keep slip-on socks for dress shoes in my office. 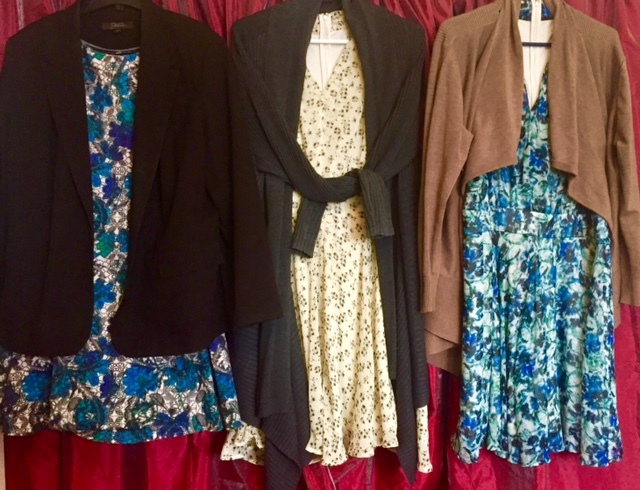 All my dresses look great with one or more of these combos and so the entire process of getting dressed requires very little thought on my part because it all works. I also have a couple of fancy blazers (all thrift shop finds) for days when I have important meetings. My current boss taught me this awesome trick of always keeping a black blazer in your office in case you are caught off-guard by a high-level meeting. If you dress business casual like most people do that black blazer should look great with whatever you are wearing. This tip has come in handy for me a few times! Finally, I do have a pair of beautiful wool legwarmers that come in handy during our frigid Canadian winters when I have to walk 10 minutes to the bus stop. If you live in an area with chilly winters, I can’t recommend them enough if you have to walk or take public transportation to work (you winter bikers are better served with snow pants as you have different challenges!). There is a great Simpsons episode where Marge finds a deeply discounted CoCo Chanel dress and ends up running into some elite women from her past who note how great she looks and invites her to the country club for dinner. Of course, she only has the one dress so every night she alters the dress into a new outfit so she can keep up appearances. It’s a great episode because it delves into the folly of trying to impress people who really aren’t that important. But dressing for professional work is a trickier beast, unless a> you are like Mr. Tucker who not works in IT (not known for its adherence to fashion) but also works from home so he only has about 5 pairs of jeans; or b> wear a uniform to work. Most of us want to look tidy and professional and some of us want to do this without thinking about it much, if at all. I know other people who adore fashion and accessories and really enjoy the artistic process of dressing well and to them I say: great, I am so glad you love that! You do you! But for the rest of us who are looking for a way to dress nicely without a lot of work and effort, taking some time to build a system is the easiest way to manage it. I know I can grab any dress in my closet and look great in under two minutes – less in the summer – without breaking a sweat. If you bike to work, having a lightweight and portable dress that you can roll up into a ball is super easy. It won’t come out all wrinkled when you put it on at work and doesn’t take up too much space in a backpack or paneer. By having the full 10 dresses you guarantee that by rotating them they will look great for years before you have to replace them. Now that I’ve built this system, I haven’t bought a new piece of clothing in over a year and a half. Everything I do have looks great. 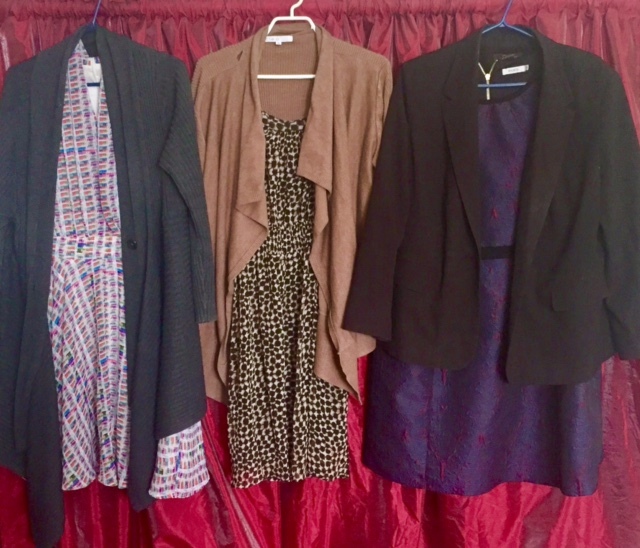 With 10 dresses, 5 pairs of tights, three cardigans, and two pairs of shoes you have everything you need to look good over the course of the month with only wearing the same dress twice. People at work will be none-the-wiser and you can be satisfied in knowing you look great and for very little money. *I will admit to having fancier shoes I keep at home but my core work shoes are these two pairs of flats. Thanks for this. I don’t wear dresses at all save for special occasions so i stick to dress pants and nice tops. I’m a pretty simple dresser and i don’t like many accessories either. I always set out my clothes the night before to avoid decisions and waking up my other half who is still sleeping at 5:30 am. I just got a pair of leg warmers (black) for Christmas and i’m not quite sure what to do with them (they are lovely) as i don’t wear dresses or skirts. i do need to get some new clothes though (haven’t done so in over 3 years and we now have Simons :)) I have yet to find a blazer that i like and that isn’t a billion dollars!